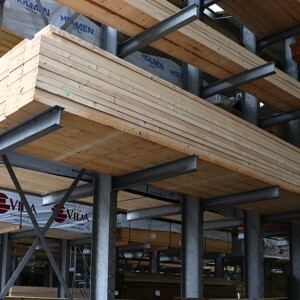 A reliable option for when large timber panels are required is the use of tongue and groove (T&G) timber. A key benefit of T&G is that the joint is only visible from the ends of the panels, allowing for a neat and uniform finish on the facing surface. As the joint extends across the complete length of the material it allows for a very large area for adhesives, making it a very strong option when glued. Properly installed tongue and groove panels offers outstanding resistance to moisture, this is because the adhesives used to seal the joints will prevent any moisture from getting through the gaps. This moisture resistance makes T&G ideal for exterior wall cladding on structures such as sheds or cabins. Aside from use as cladding, tongue and groove is primarily used when a large panel surface is required, and so is formed from joining narrower panels. This can be the case in the construction of tables, floors, doors and more. For more on tongue & groove timber options, visit your nearest Boys & Boden today and speak with the helpful staff.